UBC General President Douglas McCarron recently sent the following letter to all Delegates in the United States, asking them to take action on a pending trade pact with Korea. As you know, unfair trade policies have hurt every member of our union and every worker in the United States. The ongoing economic downturn has only made those effects worse. I hope you will take a few minutes to read the enclosed letter that I sent to Representatives and Senators in the U.S. Congress regarding another proposed free trade agreement, this time with growing industrial power Korea. The Obama Administration has made some attempt to change the original wording agreed to by the Bush Administration in 2007, but after three years of negotiating, this agreement remains essentially the same as its predecessors. It has no new labor standards, not even minimum worker rights; continues provisions in earlier trade pacts allowing foreign companies to challenge US financial, labor, and other regulations; and constrains the United States' ability to enact certain types of financial reforms. The Economic Policy Institute estimates that at least 159,000 jobs will be lost under this pact. After you've read the letter, I hope you'll take action. In just a few days the U.S. Congress will vote on the proposed agreement. I urge you to write or e-mail your U.S. Representative and Senators urging them to protect U.S. jobs and workers' rights worldwide by voting against eh proposed Korea Free Trade agreement. You can also sign in at Carpenters.org/Members to register as an "e-Activist" so you can stay informed and quickly send messages to Congress on this and other vital issues. 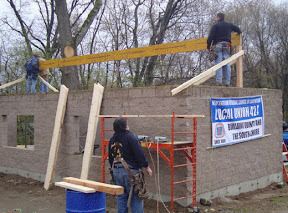 Carpenters from Local 424 volunteered their time to build a new snack bar at a local Little League field in Braintree, MA. The snack bar was built at Hollingsworth Park, which hosts over 700 players a year. The volunteers saved the league an estimated $10,000. ??That? ?s money that we would have had to raise and pay off. It means a lot to the program,?? said Steve Guilbault, the vice president for the League? ?s Board of Directors. The donation drew the attention of Town Hall, who praised the union? ?s efforts.
? ?In these challenging times, this kind of volunteer effort is especially valued,?? said Peter Morin, the chief of staff and operations for Braintree. The volunteer carpenters completed the project in just 5 days. Permanent signage recognizing the efforts of the Carpenters Union will be hung on the outfield wall in the Spring. The Local 424 volunteers were: Dave Curley, point person and project foreman; Steve Paker; Steve Singleton; Brian Knox; Tom Duncanson; Dave Shurtleff; Brian DuBois; Joe MacLellan; and Frank Baxter. The Boston Globe ran a piece about the volunteer efforts, it can be read here.